Possibly not the ultimate list of the best free VST equalizer plugins but hopefully as it get’s updated it will get close. Please if you use free vst plugins of any flavour, support them in any way that you can, even the smallest donation will be appreciated. If you can’t find a way to do this via their individual sites then try and contact them via email. Classic EQ is a 7 Band Stereo Equaliser with a warm analog sound, well suited to make non-surgical tonal corrections on all instruments, vocals and final mixes. The passive and additive structure, together with unique “Warm” and “Saturation” algorithms, produces warm and pleasant sound, just like some of the most expensive vintage gear. The left and right channels can be adjusted individually or linked together. Posihfopit – Free EQ Equalisation vst plugin – Scroll down to find! The precursor to the ‘Electric Q’ this is a pretty easy to use equaliser vst plugin. Just drag and shape your eq. Although probably best if you understand what your dragging and shaping ahem. This is a pretty cool VST plugin form Leftover Lasagne. Needs a bit of work to understand, works in a similar way to the Pultec. It is free but please if you find yourself using it please donate to the authors. “Fast and easy” 7-band digital graphic equalizer. It uses FIR filtering delivering a very nicely-sounding linear-phase equalization. EssEQ uses 128 point filter kernel. This plug-in is very good at quick frequency balance adjustments. 7-band harmonic (overtone) graphic equalizer with multi-channel operation support (supporting up to 8 input/output channels, host setup-dependent). 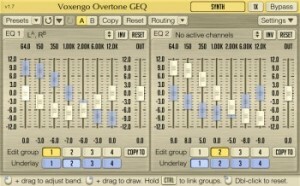 Overtone GEQ offers extensive internal channel routing capabilities, and supports mid/side channel processing. 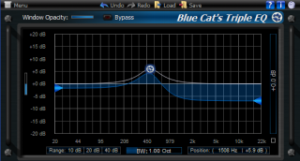 Blue Cat’s Triple EQ is a 3 bands semi-parametric equalizer that can be controlled as a single filter with customizable shape. It includes a low shelf filter, a high shelf filter and a boost/cut peak filter. Its wide range of gain (+/-40 dB per band) and bandwidth (.01 to 5 Octave) makes it very versatile to create any filter shape. The three filters are linked together so that when you change the center frequency or the bandwidth, the parameters of the three filters are modified accordingly: you can control the entire equalizer characteristics with a single mouse click. 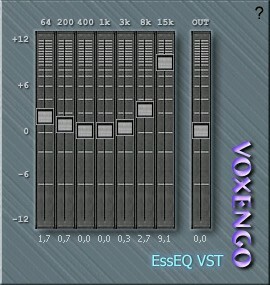 FREE QUEUE EQ PLUGIN: Another excellent addition to your free VST plugins folder from VescoFX. This free VST plugin is an equalizer. The sound of this EQ will very much remind you of many classic analog designs. You get access to four bands of equalization with two shelving filters and two peaking filters, a design which matches that of many sought after high-end console equalizers. Many mix recipes are included as saved settings which can be loaded through your VST host. 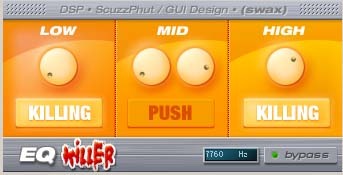 ‘EQ Killer is a switchable EQ module vst plugin in the style of DJ “Kill Switches”. The Linear Phase Graphic EQ 2 by Slim Slow Slider is a free VST plugin comes in two different flavours but actually seem to be the same effect, maybe I’m missing something? Anyway the controls are quite simple the frequency adjustment in the graphic equalizer stage itself are adjusted by a simple drag using the mouse. I really like the dragging control for some reason,whilst you adjust as you click on the ‘screen’ the freq and gain amount are shown below. There’s also a Compare button. This is a really nifty equalizer vst plugin that seems to have quite a small CPU load. How it compares with other VST eqs is up to your ears really. KarmaFX Plugin Pack is a collection of quality effect plugins that are small, simple and easy to use. Plugins that simply get the job done without too much knob tweaking. The pack includes a simple filter plugin, a tempo controlled delay, a 31 band graphic equalizer, a reverb and a User’s manual. Check out the sound demos and view the full specs below. You’ll need to scroll down Marcus’s page there to find it. Parametric graphic equalizer with excellent response all the way up to Nyquist. It never clicks, and it handles deep bass well too. The Nyquist frequency is the highest representable frequency for a given sample rate. The trebliest of the treble. Most other digital eqs have great problems producing a natural sound here. Hopefully some of these Free Plugins will add to your mixing arsenal. This list will be updated as new Equalizer plugins become available.